Doggone it. PM Kevin Rudd turns children’s author with Jasper and Abby. If someone asked us here at Babyology HQ to make a list of people least likely to pen a children’s book, we’d have placed Prime Minister Kevin Rudd somewhere way on top. Around the spot where Madonna would be if she hadn’t gone and written those English Rose books. Well, it’s strike two for us because K-Rudd this week follows in the footsteps of the Material Girl to release his own picture book for children. While we haven’t yet had the chance to judge it for ourselves, we hear it’s a rather entertaining read and remarkably free from any of the poli-waffle or jargon that normally pops up when politicians put pen to paper! 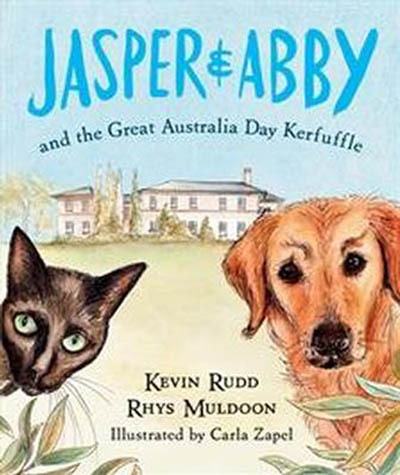 Jasper and Abby and the Great Australia Day Kerfuffle tells the story of the Prime Minister’s pet dog and cat and their adventures one day at Kirribilli House. Mr Rudd co-authored the book with handsome Playschool regular Rhys Muldoon in between penning policies on climate change, sparring with the Opposition and swapping how-to-run-a-country pointers with foreign dignitaries and heads of state. “It has not been the most demanding text I have worked on,” he joked with reporters at the book’s official launch, before offering this more serious aside. “Whatever we can do to encourage mums and dads and grandmums, grandads and carers to read to little ones, frankly that is a good thing for the country and a good thing for them.” Yes Kevin, we think so too. All proceeds from the book will go to Melbourne’s Royal Children’s Hospital. Which is good enough reason to add it to your kids’ home library, in our opinion, even if you don’t happen to be a Labor voter! Jasper and Abby and the Great Australia Day Kerfuffle retails for $24.99 and is available online at Fishpond.